Hilary Scott is writing a new soundtrack to your life. Out Of The Wilderness is surprising, driving, female folk rock. 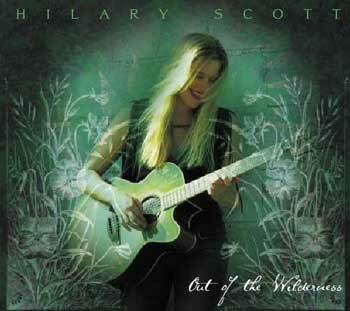 Label : Belltown Records, Inc.
“Out of the Wilderness” is an enhanced EP that takes Hilary Scott’s artistry to new heights, showcasing her talents with some of Nashville’s finest studio musicians. The CD was produced by Matthew Wilder and recorded in the Wilderness Production studios in Nashville. Executive Producer is Stephen Gardner. Artists include: Jerry Kimbrough, acoustic and electric guitars; Gary Lunn, bass; Steve Brewster, drums; Kenny Vaughan and Brandon Henegar, additional guitars; Matthew Wilder, guitar and keyboard; Hilary Scott, vocals, guitar and keyboard. In addition to this CDs superb audio tracks, it also contains a delightful enhancement that includes the artist’s bio, a photo gallery, and two engaging videos of the artist discussing her music and performing live at See Sound Lounge, Seattle. The videos were produced by Global Griot Productions, Inc., Seattle, WA. Beyond Hilary’s intelligent and insightful lyricism, Hilary’s vocal range is captured beautifully on this disc, as well as her stylistic diversity, with elements of rock, folk, pop, country and blues represented in ear-catching form on this fantastic professional recording! Hilary has since continued to collaborate with Wilder, signing a co-writing/publishing deal with him in 2006 and having the opportunity to write with Nashville royalty such as John Goodwin and Angela Kaset. This project gave birth to songs that dip into techno, dance and pop genres. Look for these to be released sometime in 2007.